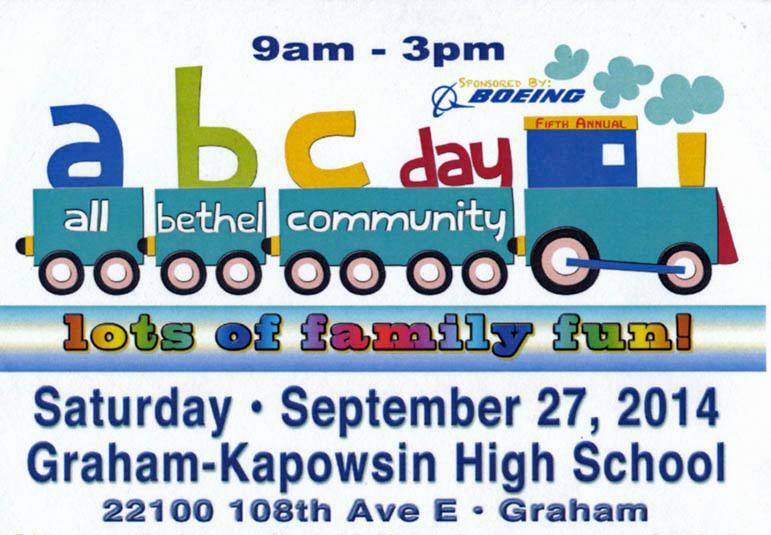 The sixth annual All Bethel Community Day (ABC Day) is coming up on Saturday, September 27, from 9:00 am to 3:00 pm, at Graham-Kapowsin High School. This fun-filled day will give our families a chance to see all the wonderful things our community has to offer. There will be booths and displays of family, health, and social services, as well as fun activities for all ages at this FREE event. Joint Base Lewis-McCord and Pierce County Fire and Rescue will display vehicles and personnel. Special guests include Blitz, the Seahawk mascot, and Captain America from Marvel Comics! Come see the animals at the petting zoo, and ride a camel or a zebra! Local businesses that will be represented are Boeing, Point Defiance Park and Zoo, Umpqua Bank, See’s Candies, Smith Brothers Farm, LeMay Enterprises, Country Wagon, Community Health Care, Rainier Therapeutic Riding, Multicare WIC, and many more. Other exciting new additions to this fun-filled day will be an Interactive Center for Learning and Fun – hands on activities for kids to learn about science, build various things, play carnival games, fly helicopters, and a participate in a Take Home Project Center. Again this year a Raffle Showcase with items donated by local businesses will be held throughout the event. The ABC Day celebration will also have several performance areas with student’s sharing their talent. For more information visit the Yes! Bethel Kids website on Facebook at https://www.facebook.com/YesBethelKids.